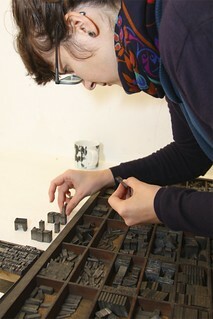 As part of our focus on letterpress we are pleased to take on our first post-graduate level Letterpress Apprentice. Saria Digregorio will access high quality teaching and support from our expert typesetter and printmaker, Sat Kalsi and join our community of artists. Through regular attendance at our studio, the apprentice will have the opportunity to learn, practice, experiment and create to gain substantial knowledge and technical proficiency. In recruiting Saria, we have found an ambitious, post graduate level designer with clear vision and initiative set on pursuing a career in design with a passion for type and letterpress. Saria will be working on a self-initiated projects, co-organise a symposium and screening about type, and collate her work for an exhibition and artist talk at LCB Depot in 2015.